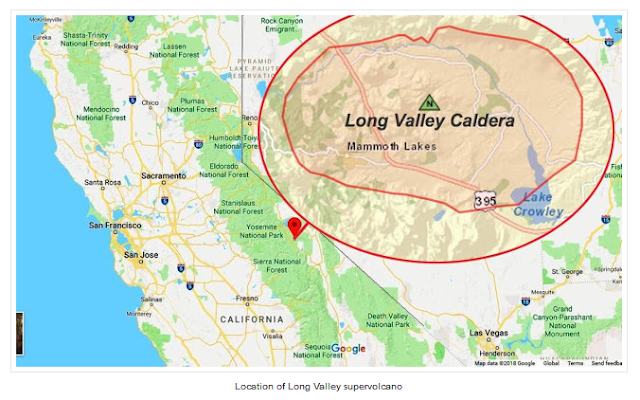 Scientists have discovered 240 cubic miles of semi-molten magma below the Long Valley Caldera, a supervolcano in eastern California near Mammoth Mountain. Some 240 cubic miles' worth of magma sat deep below the Long Valley Caldera, researchers reported in the journal Geology. But that doesn't mean it is about to erupt on anything like the scale it has in the past. The supervolcano erupted over six days about 760,000 years ago, coating the surrounding 30 miles of land in hot ash and shooting volcanic material as far as Nebraska, the team wrote. After experiencing smaller eruptions, it has stayed dormant for the last 100,000 years or so. Today, the 20-mile long Valley Caldera lies on the spot. Gradual uplift at the center of the caldera garnered significant interest over the last 40 years. But until this latest study, scientific understanding of what lay beneath the surface was patchy. More than 20 studies found small features a few miles down, and larger one deep underground, study author Ashton Flinders of the U.S. Geological Survey told New Scientist. “This has left a bit of a shadow zone in the midcrust, where the shallow studies can’t see and deeper studies tend to blur anything they do see,” he said. Flinders and his team created a 3D image of the rocks using seismic data collected over the past 26 years by stations up to 100 miles from the caldera. Their data suggested a huge store of magma lies in the previously obscured region. Because less than half of the magma is thought to be molten, it’s very unlikely to see the kind of supervolcano eruption of 760,000 years ago. Flinders’s team believe only about 27 percent of the magma is liquid. But smaller regions of the supervolcano may be closer to the 50 percent melt threshold, which means normal-sized eruptions are theoretically possible. Meanwhile, scientists recently discovered Wyoming’s famous Yellowstone supervolcano may have formed not by a plume of magma rising up through cracks in Earth’s crust but by the fracturing of a massive slab of oceanic crust underneath part of the North American continent.